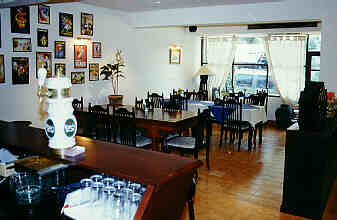 Enjoy traditional Italian and Thai cuisine, daily open 11.30 A.M. - 10.30 P.M. I have been to Chiang Mai some 4 times, and there is a bar you might want to have listed in your site. The hopelessly named Viking Bar at soi 9 off Moon Meuang Road not far from Tapae Gate is a meeting place for foreigners living in or frequently travelling to ChiangMai. You can meet interesting people there. It is not a "a-go-go" bar, but rather more like a cafeteria, with a pool table and TV. It is rumored to be under new management now, which is good, as the former owner did not take to good care of the place. Friendly atmosphere, and very good green curry chicken. Some Tuk-Tuk drivers usually hangs out, so transport is available. Bitte schauen Sie auf jeden Fall zu einem späteren Zeitpunkt wieder hier hinein!